Remember my Summer Asparagus Salad? After I’d finished perfecting that recipe I had a ton of fresh asparagus left. 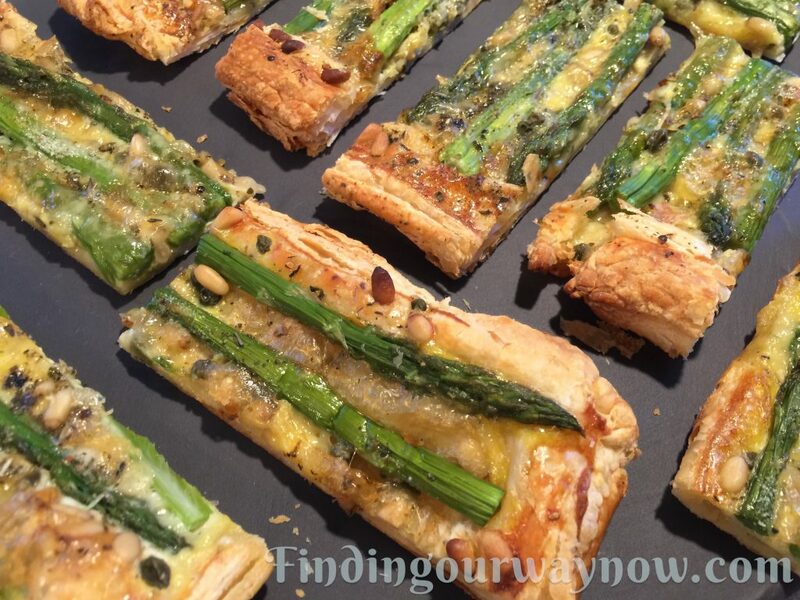 That’s when the idea for a fresh asparagus tart came to mind. It’s a basic recipe that can be a great appetizer or served as a light luncheon entrée with a side salad. I would love to take credit for this recipe, but my inspiration came from a fabulous cookbook; “The Forest Feast” by Erin Gleeson. However, I did make a few changes, but very little. It’s a simple, straightforward recipe with a ton of flavor. 14 to 16 young fresh asparagus. Clean, trim, and peel the thick skin from the bottom of the stalks of the asparagus and set aside. Dust a parchment sheet with a bit of flour. Place the puff pastry on the parchment and roll out to a 12 x 10-inch rectangle. Move the parchment with the puff pastry to a baking sheet. Gently fold the edges of the dough, about ½ inch, around the puff pastry. Lightly press the rolled edges down to adhere. Cut thin strips of the Brie and then flatten a bit with your hands. Dot the center of the prepared puff pastry with the Brie pieces until the center of the puff pastry has a good cover of cheese. Whisk the egg until thoroughly blended. Drizzle the beaten egg over the Brie. If needed, use a pastry brush to distribute the egg evenly. Place the prepared asparagus side by side over the Brie in an alternate fashion. Sprinkle the garlic powder, herbs, salt and pepper evenly over the asparagus. Finish by sprinkling the capers and pine nuts evenly over the tart. Finally, drizzle a thin stream of olive oil over the top. Place the tart in the oven and bake for 20 to 22 minutes or until golden brown. Allow the tart to cool on a cooling rack for about 10 minutes before cutting and serving. 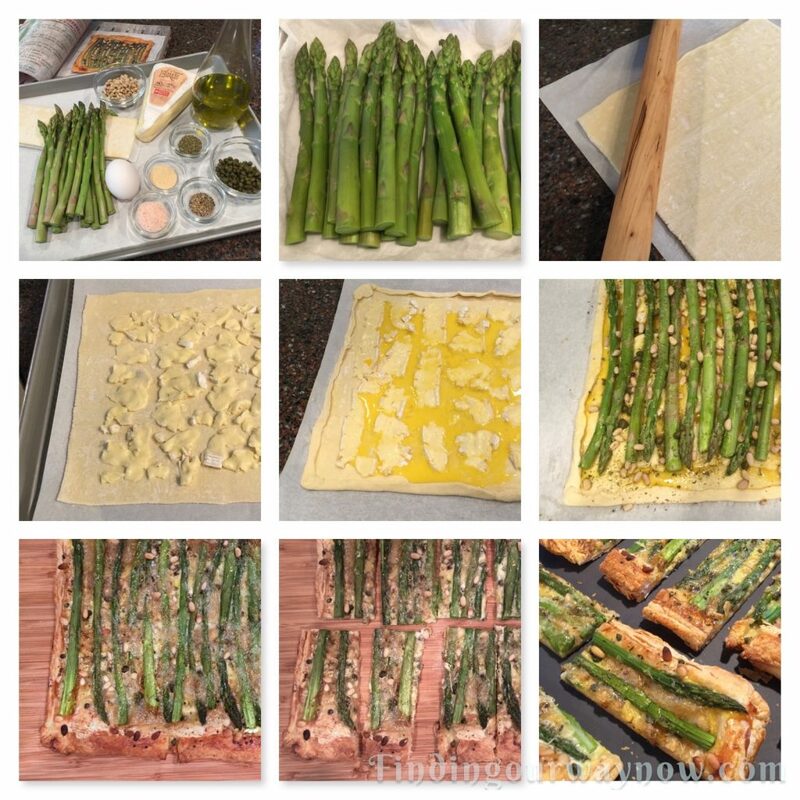 Notes: Try to find thin, young, and tender asparagus; if you aren’t able, a bit of blanching before assembling will help them cook to perfection. If you’re not a fan of Brie, any flavorful soft cheese will do just fine. Areas of the tart may puff up while cooking, not to worry it will deflate and flatten when it comes out of the oven and cools. If you’re looking for finger food, cut the 12 strips in half making 24 yummy bite size pieces. If you prefer the tart warm instead of room temperature, place cut pieces on aluminum foil and heat them in the oven for a few minutes, and you’re good to go. 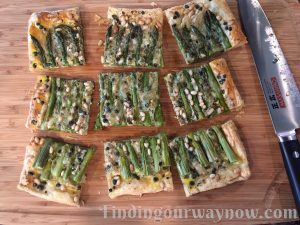 This fresh asparagus tart is a quick, fun and elegant appetizer or a light luncheon entrée. Regardless of how you choose to serve it, it’s a truly yummy thing to eat.